Then you go and read these guys’ blurbs, and synopses, and they leave you aghast. Because, you see – plain-vanilla Muses do not do blurbs. Blurbs are the bailiwick of the Blurb Muse, and she’s quite another story. 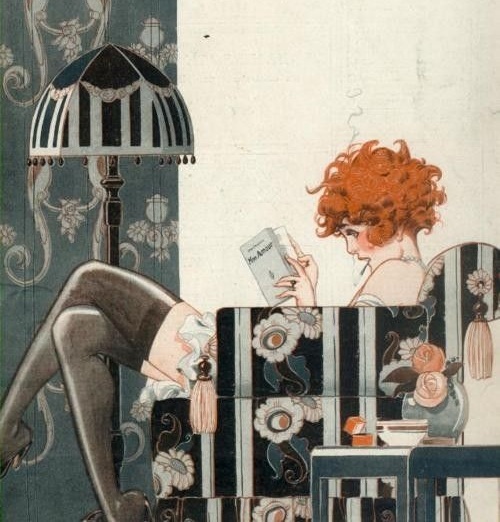 The Blurb Muse is not some classy act out of Mucha – the way I envison her, she’s a rather disheveled, chain-smoking, super-caffeinated red-headed chick in underwear, stockings and high heels, straight out of La Vie Parisienne. She’s dirty-talking and frantic, her make-up smeared and her manners not exactly posh. She probably has a naughty tattoo somewhere. But she does the job – she sells the book, putting together fifteen lines of copy that actually hook the reader, working hand in hand with the cover. It’s not art, it has more to do with the buying and selling of pleasure. Sort of like soliciting, you know. Now I don’t mean to offend, but I’ll happily leave the Mucha Muse – for all her charms and soft allure – right where she is, and stick with my Blurb Muse every day of the week. Then we’ll invent some way to sell’em.